We’re super excited to let you know that we’re part of the UA Next Generation Charity Challenge. The Challenge is a fundraising campaign being launched by Under Armour. To give back, Under Armour will be donating $50,000+ to organizations like ours focused on sparking positive social change by fueling the behavioral, educational and physical advancement of the NEXT generation. The charity that raises the most throughout the Challenge will get $20,000 from Under Armour. Second place gets $10,000 and third gets $5000. We’re out to raise as much money as possible for our cause so we can win that $20,000 grand prize donation. We think we can win and to do so, we definitely need your help. Every donation makes a difference, no matter how small. Please email CrowdRise at UANEXTChallenge@CrowdRise.com if you have any questions at all and they’ll help solve everything. This entry was posted in Speak Up and tagged education, Julie Evans, K-12 education, Speak Up, Speak Up 2013, Under Armour Next Generation Charity Challenge on September 26, 2013 by project_tomorrow. Congratulations to this year’s Speak Up 200 Cohort! This annual recognition program highlights schools that are effectively incorporating Speak Up data into their local decision-making. Each year, finalists are selected based on total student participation, length of time involved with Speak Up, and use of data in local decision making. 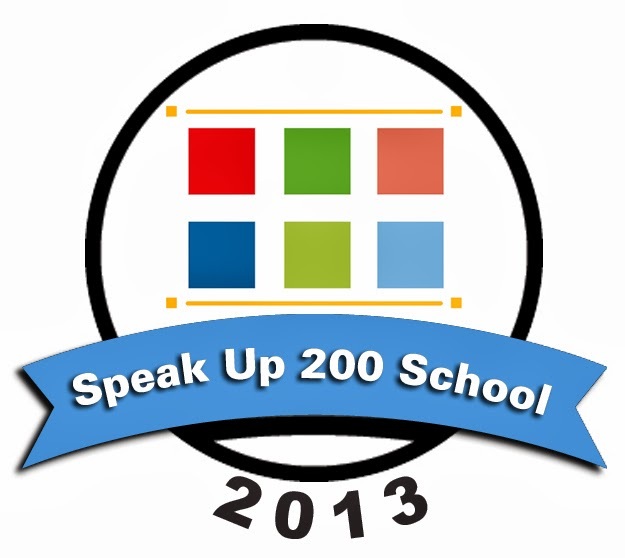 Congratulations to the Speak Up Top 200 Schools for their participation in Speak Up 2012. This entry was posted in Speak Up and tagged education, Julie Evans, K-12 education, Speak Up, Speak Up 200, Speak Up 2013 on September 23, 2013 by project_tomorrow. We hope the week treated all of our followers well. Today on the Project Tomorrow Blog, it is Fun-Fact Friday! What did you know? What new facts did you learn? This entry was posted in Speak Up and tagged education, fun fact friday, Julie Evans, schools, Speak Up, Speak Up 2013 on September 13, 2013 by project_tomorrow. Happy September to all our followers and supporters! Details regarding our “Celebration of 10 Years of Student Voices About Digital Learning” Cocktail Reception in Washington, D.C.
Be sure to let us know what you think by following us on Twitter, Facebook, and ourBlog! SPEAK UP 2013 opens on October 2nd! Last year over 466,000 students, parents and educators representing over 8,020 schools nationwide participated in Speak Up– Now’s your chance to get involved! Be a part of the conversation and share your ideas about how to leverage technology in schools to promote better learning. Register your school or district to participate today! Join with educators from across the country that use the Speak Up Surveys to identify how their students, teachers, administrators and parents want to use technology for learning, communications and collaboration. Get a jump start on Speak Up participation by registering as the primary contact for your school or district today! As the primary contact for your district, school or organization you will be in charge of the promotion and encouragement of the survey at your selected organizational level. In return, you will receive free, online access to your aggregated results with state and national comparisons in February 2014.  Surveys for: K-12 students, teachers, librarian media specialists, parents, school site and district administrators, technology leaders and NEW this year business partners and community members.  Survey topics include: learning and teaching with technology, science instruction and STEM career exploration, professional development, online assessment, digital citizenship and emerging technology topics such as mobile devices & BYOD, online learning, social media and digital content.  New questions this year on education technology funding, common core standards, blended learning, flipped classroom models and online reading comprehension.  Each participating institution receives a free online report in February 2014 aggregating all local data with national data to use for comparative benchmarking and local advocacy.  NEW THIS YEAR! Community members and business partners survey.  NEW THIS YEAR! Educators and parents will not be required to enter a survey password. *Students will still need a survey password to take the survey.  Use your local Speak Up data to: advocate for policies, programs & funding, as input into local plans, support grant proposals, engage your community, and learn about the ideas of your students, staff and parents.  Lend your voice to national advocacy efforts and help improve educational opportunities for ALL kids! Register today and spread the word. Be sure to Speak Up on October 2nd! Our Speak Up Promotional Materials are here to help you! To see a full list of our helpful and handy flyers and guides, visit our site here. In the past 10 years, our nation’s classrooms have been irrevocably changed by the inclusion of digital learning tools and resources such as e-textbooks, online classes, tablet computers, educational games and social media. At the emotional center of this digital conversion of our K-12 classrooms and schools has been the aspirations and ideas of our K-12 learners whose desires for a more social-based, un-tethered and digitally rich educational experience has changed forever the way we think about teaching and learning. With the first Speak Up online survey in 2003, Project Tomorrow created a new national movement to recognize the value of K-12 student voices within education. Since then, over 2.5 million K-12 students (and over 500,000 teachers, administrators and parents) have shared their authentic, unfiltered views on the use of digital tools and resources through the annual Speak Up surveys, creating the largest collection of K-12 education stakeholder data. Over the past 10 years, the Speak Up data findings have been used regularly by federal, state and local policymakers to inform programs, plans and policies with a common goal in mind – improving educational opportunities for all students. From the halls of Congress to school board meeting rooms all across the country, the Speak Up National Research Project has provided the catalyst for listening to the ideas of our nation’s most important clients of education, the students. Please join Julie Evans, CEO of Project Tomorrow and the Project Tomorrow Board of Directors to celebrate this 10 year legacy of impact and to applaud the partners and investors who have made Speak Up not only a national research asset, but an important strategic tool for schools and districts nationwide. Your participation in this invitation only celebration would be most appreciated. If you will be in or around the DC area and would like to attend, please respond to Jenny Hostert at jhostert@tomorrow.org or 949-609-4660 x17 by Friday, September 13. Tuesday, October 22, 11:00 am – 4:00 pm CT.
Parents – and especially the new digital parents – are driving change in K-12 school districts across the country, raising the bar on effective use of technology in the classroom, mobile access to school and district websites, and effective use of social media and real-time communication tools. It’s never been more clear that to achieve your education goals, you need to engage parents as partners and advocates. Join us for this important symposium to explore findings of critical research on digital parents and family engagement, and how they impact student success. You’ll also hear from other K-12 districts about their efforts to engage families and achieve greater alignment among administrators, teachers and parents to establish educational goals and improve student achievement levels. The session will review extensive research around the “New Digital Parent” and find out how this emerging cadre of parents is influencing school-to-home communications, effective use of technology in the classroom, and family outreach in K-12 communities. Learn about key characteristics of the “New Digital Parents” and how to connect with them. This NPRM is a very long document and there are lots of proposed rule changes for E-rate funding. Here is a link to the actual NPRM. ISTE is providing a form on their website to help facilitate comments from school and district leaders. Check it out here. We are interested in your thoughts also. One of the proposed rule changes includes eliminating the ability for districts to use e-rate funds for website hosting services and email services. The new rules would also not cover mobile devices or off campus 3G/4G connectivity. What do you think about these changes? How would that impact your district? If you are able to see the comment box below, please share your thoughts. If you are unable to see the comment box below, please share them with us on a special location on our website here. This entry was posted in Speak Up and tagged education, Julie Evans, K-12 education, Speak Up, Speak Up 2013 on September 12, 2013 by project_tomorrow. The Beginning of the School Year is Upon Us! Check out what city the “Strong Start, Bright Future” tour is headed next! Parents, educators, and school administrators: what aspirations and goals do you have for the year? Students: How do you hope to approach the new school year, and what knowledge do you hope to gain? Be sure to let us know in the comments below. Like so many of you who have been conjuring up thoughts and plans for the upcoming year, Secretary of Education Arne Duncan has been doing the same. Yesterday was the launch of his “Strong Start, Bright Future—Back to School Bus Tour” in New Mexico. The tour’s main purpose is to promote the critical and pivotal investment in education to cities and communities across the United States. Secretary Duncan will also inform others about the ConnectED initiative, and how it can help our students gain skills to compete in the 21st Century. Wondering where the “Strong Start, Bright Future—Back to School Bus Tour” will stop next? Click the link here to learn more. Don’t forget to register for Speak Up 2013! Surveys open October 2nd, and will run through December 20th. This entry was posted in Speak Up and tagged Back to School, Bright Future, ConnectEd, education, Julie Evans, Speak Up, Speak Up 2013, Strong Start on September 10, 2013 by project_tomorrow. The middle of the week calls for some time to catch up on the most recent news and events concerning education. Check out the Project Tomorrow Blog each week for our Around the Web Wednesday series. Read about all the various topics below! Be sure to let us know which one intrigued you the most! Don’t forget to Register for Speak Up 2013, and vote for Project Tomorrow’s CEO Julie Evans’ panel at the SXSWEdu conference. 1. Do you believe education is in constant change/evolvement? Read about it here! 2. A Washington D.C. university looks to expand online education programs: Read about it here! 3. The growth of online learning: Yay or Nay? Read about it here! 4. What education reforms are needed? Read about it here! 5. Florida teachers and science education: Read about it here! 6. STEM training for middle school teachers: Read about it here! 7. Race to the Top grants: Read about it here! 8. Technology and New York schools: Read about it here! 9. U.S. Department of Education awards $12.3 million in grants: Read about it here! 10. The teacher turnover crisis in American urban schools: Read about it here! This entry was posted in Speak Up and tagged Around the Web Wednesday, education, Julie Evans, K-12 education, Speak Up on August 21, 2013 by Project Tomorrow.